The Centers for Medicare & Medicaid Services (CMS) has released the results of its 2018 Value Modifier (VM) program (https://www.cms.gov/Medicare/Medicare-Fee-for-Service-Payment/PhysicianFeedbackProgram/Downloads/2018-Value-Based-Payment-Modifier-Factsheet.pdf), and fewer eligible physicians will receive a negative payment adjustment than in the past two years. Beginning, Oct. 18, CMS is giving physicians 30 days to preview the information about them on Physician Compare before publicly releasing it online. Individual physicians and groups can now access the latest results of their annual Physician Feedback report and Quality and Resource Use Report. They provide information on the 2016 Physician Quality Reporting System and the 2016 Value-based Payment Modifier as well as if the physician or group will receive a 2018 payment adjustment under either program. The Centers for Medicare & Medicaid Services (CMS) is expanding its new Quality Payment Program website to give administrative staff tools to better manage practice and physician information. As part of the process, CMS is looking for people to help provide feedback. If your physician group intends to use the Centers for Medicare & Medicaid Services (CMS) Web Interface to report to the Merit-Based Incentive Payment System (MIPS) or the Consumer Assessment of Health Providers and Systems (CAHPS) you have until June 30 to register. You can use the Quality Payment Program (QPP) website(qpp.cms.gov) to register. No registration is required if you are reporting as an individual or if your group is using any other reporting method. Only groups of 25 or more clinicians can report using the CMS Web Interface. However, groups of two or more clinicians may administer CAHPS, which is optional in MIPS. Group participants in a Shared Savings Program accountable care organization do not need to register. CMS has automatically registered groups for the CMS Web Interface if they previously registered as a group under the Physician Quality Reporting System (PQRS). If you need to review or remove your registration, you can do so through the QPP website. To register, a member of the group must have a valid Enterprise Identity Management (EIDM) account with the Physician Value-Physician Quality Reporting System (PV-PQRS) role. If you are unsure if someone in your group has this role or need to reactivate your account, you can contact the QPP desk at 866-288-8292 or qpp@cms.hhs.gov. CMS has created guides for obtaining the PV-PQRS role(qpp.cms.gov) or creating a new EIDM account(qpp.cms.gov). A CMS Web Interface Registration Guide(qpp.cms.gov), a CMS Web Interface fact sheet(qpp.cms.gov), and a CAHPS for MIPS fact sheet(qpp.cms.gov) are also available. CMS will be hosting educational webinars on group reporting and registration in the future. The QPP was created under the Medicare Access and CHIP Reauthorization Act (MACRA) and adjusts Medicare payments based on the quality of care provided by physicians instead of the volume of services. The first performance period for the QPP began on Jan. 1. More information is available on the American Academy of Family Physicians MACRA ready page. If you are reporting to the Physician Quality Reporting System (PQRS) using the Electronic Health Record (EHR) method, you now have a little more time to submit your data. The Centers for Medicare & Medicaid Services (CMS) recently announced that it was extending the Feb. 28 deadline for PQRS submission through the EHR or qualified clinical data registry (QCDR) mechanisms. Eligible professionals (EPs) and groups have until March 31 to submit their 2016 quality reporting document architecture (QRDA) I or III files for the EHR Direct, EHR Data Submission Vendor (DSV), and QCDR reporting mechanisms. Qualified registries and QCDRs that use XML files also have until March 31 to submit. Vendors may have their own individual deadlines that may be earlier. EPs should work directly with their vendors to ensure their data is submitted before the deadline. EPs who fail to satisfactorily report to PQRS for 2016 will receive the maximum negative payment adjustment in 2018. EPs failing to report will also face the maximum negative payment adjustment for their group size under the Value-Based Payment Modifier Program (VBPM). Payment adjustments for the PQRS and VBPM are separate from those for the Medicare Electronic Health Record Incentive Program (a.k.a “meaningful use”). EPs have until March 13 to submit their meaningful use data. EPs can submit CQMs using the PQRS EHR reporting method or QCDR QRDA III files to fulfill the CQM requirements for both meaningful use and PQRS. EPs can contact the QualityNet Help Desk for questions about PQRS and the EHR Information Center Help Desk (1-888-734-6433, option 1) for questions relating to meaningful use. The final year for which EPs are required to submit data for PQRS, VBPM, and meaningful use is 2016. The Medicare Access and CHIP Reauthorization Act (MACRA) of 2015 consolidates these programs into the Quality Payment Program (QPP). The first performance period for the QPP began on Jan. 1. Physicians can learn more about the QPP on the AAFP website or in the latest issue of FPM. 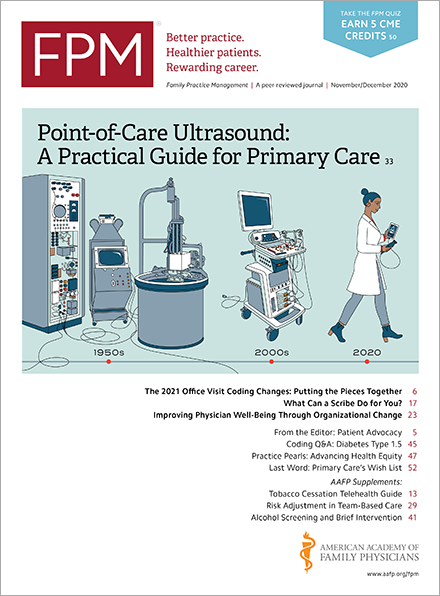 The Centers for Medicare & Medicaid Services (CMS) has extended until Dec. 7 the deadline for family physicians and others to request an informal review of their value modifier and Physician Quality Reporting System (PQRS) results, which will otherwise impact Medicare physician payments in 2017. CMS released the 2015 annual Quality and Resource Use Reports (QRURs) on Sept. 26. The 2015 annual QRURs show how physician groups and solo practitioners performed in 2015 on the quality and cost measures used to calculate the 2017 Value Modifier as well as their 2017 Value Modifier payment adjustment. Physician groups or solo practitioners may request an informal review of perceived errors in their 2017 Value Modifier calculation during the informal review period, which now expires on Dec. 7 at 11:59 p.m. (EST). Additional information about the 2015 Annual QRURs and how to request an informal review is available on CMS’s 2015 QRUR and 2017 Value Modifier webpage(www.cms.gov). In 2017, CMS will apply a downward payment adjustment to those who did not satisfactorily report under the Physician Quality Reporting System (PQRS) in 2015. If you have any questions regarding the status of your 2015 PQRS reporting or are concerned about potentially receiving the PQRS downward payment adjustment in 2017, you can also submit an informal review request for that and ask CMS to investigate your payment adjustment determination. However, again, you must do so by Dec. 7. CMS will be in contact with every individual eligible professional or PQRS group practice that submits a request for an informal review of their 2015 PQRS data and notify them via email of a final decision within 90 days of the original request for an informal review. All CMS decisions will be final, and there will be no further review. 1. Go to the Quality Reporting Communication Support Page (CSP)(www.qualitynet.org). 5. A new page will open. Complete the mandatory fields in the online form, including the appropriate justification for the request to be deemed valid. Failure to complete the form in full will result in the inability to have the informal review request analyzed. CMS or the QualityNet Help Desk may contact you for additional information if necessary. Please see the PQRS informal review fact sheet(www.cms.gov) for more information. Additionally, 2015 PQRS feedback reports can be accessed on the CMS Enterprise Portal(portal.cms.gov) using an EIDM account. For details on how to obtain your report, please see the “Quick Reference Guide for Accessing 2015 PQRS Feedback Reports.” For information on understanding your report, please see the “2015 PQRS Feedback Report User Guide.” Both guides are on the PQRS Analysis and Payment webpage(www.cms.gov) on the CMS web site. • For additional assistance regarding EIDM or to ask questions about the informal review process, contact the QualityNet Help Desk at 1-866-288-8912 (TTY 1-877-715- 6222) from 7:00 a.m. to 7:00 p.m. Central Time, Monday through Friday, or via email at qnetsupport@hcqis.org. To avoid security violations, do not include personal identifying information, such as Social Security Number or TIN, in e-mail inquiries to the QualityNet Help Desk. • For additional assistance regarding the QRUR or the Value Modifier, contact the Physician Value Help Desk at pvhelpdesk@cms.hhs.gov or 888-734-6433 (select option 3). Individual physicians and groups can now access their 2015 Physician Quality Reporting System (PQRS) Physician Feedback reports, which provide valuable information about your practice and whether you will face a Medicare penalty in 2017. Physicians can access the reports through the CMS Enterprise Portal(portal.cms.gov). Users must have an Enterprise Identity Management (EIDM) account with the appropriate role to access the reports. You can also access your Quality and Resource Use Reports (QRUR), which were also recently released, through the same portal. The Physician Feedback reports will provide the determination on whether you met the PQRS criteria to avoid a 2 percent negative payment adjustment in 2017. Information is available for all measures reported by your National Provider Identifier (NPI) for each reporting method. You can review if your successfully reported all your measures and see a brief rationale for any payment adjustment, such as insufficient measures reported. It also includes reporting rate and performance rate percentages. You can file an informal review request if you feel the negative payment adjustment was an error. The informal review period is open until Nov. 30. Reviews can be filed through the Quality Reporting Communication Support Page(www.qualitynet.org). For more information or additional questions, contact the QualityNet Help Desk at qnetsupport@hcqis.org or (866) 288-8912. A Feedback Report User Guide(www.cms.gov) is available online. The Centers for Medicare & Medicaid Services will mail out payment adjustment notification letters at a later date. Accessing the Physician Feedback reports now will allow you to review your performance and file an informal review before the deadline. The 2015 annual Quality and Resource Use Reports (QRUR) are now available to all group practices and solo practitioners. The report released by the Centers for Medicare & Medicaid Services (CMS) provides data on a practice’s performance on quality and cost metrics. The QRUR also provides information on how the practice fared under the 2017 Value-Based Payment Modifier (VBPM). Authorized representatives can access the QRUR through the CMS Enterprise Portal(portal.cms.gov) with their Enterprise Identity Data Management (EIDM) credentials. You must have the correct role within the EIDM to access the report. CMS has provided guides on obtaining an EIDM account(www.cms.gov) and how to obtain a QRUR(www.cms.gov). Physicians will find in the reports performance information on the measures they submitted to the Physician Quality Reporting System (PQRS). CMS also calculates several claims-based quality and cost measures. Along with the QRUR, you can download an Excel file containing provider- and patient-level data. The information provided in the spreadsheets allows physicians to identify areas for improvement in cost and quality performance. In 2017, all solo- and group-eligible professionals will be subject to the VBPM. Payment adjustments for the VBPM depend on practice size. It is important to review the information in the QRUR for accuracy. If you feel you have been assessed a payment penalty incorrectly, you can file an informal review through Nov. 30. You can submit a review through the CMS Enterprise Portal, or you can contact the Physician Value Help Desk at pvhelpdesk@cms.hhs.gov or 888-734-6433 (select option 3). The help desk is available by phone Monday-Friday 8 a.m.-8 p.m. EST. Becoming familiar with the QRUR now is important as it will continue in some form under the Medicare Access and CHIP Reauthorization Act (MACRA). MACRA's Merit-Based Incentive Payment System (MIPS) incorporates elements of PQRS and the VBPM. The initial performance period is slated to begin in 2017.